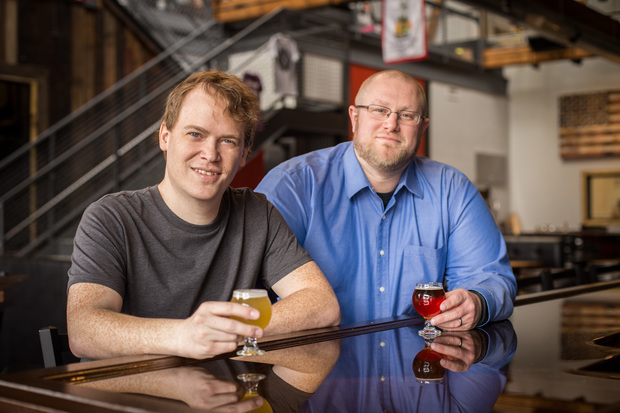 Joel Gratcyk (l.) and Jeremy Hylen are the creators of Chicagos.Beer, a guide to the breweries of Illinois. CHICAGO — Joel Gratcyk loves beer, so much so that he devoted months of work to creating a website featuring detailed information on 218 breweries in Illinois. The Chicagos.Beer site, which Gratcyk, a former Andersonville resident, developed with his friend Jeremy Hylen, debuted Wednesday. It includes 86 breweries within the city, including ones that haven't yet opened. Gratcyk said there's no comprehensive state brewery guide like it anywhere else. "We're both big beer fans, and we wanted to make something we thought would be useful," Gratcyk said. "It's for Chicago residents who might not know a brewery is near them, but people visiting Chicago would find it useful, too." Gratcyk and Hylen have been creating the free site since October, spending as many as 12 hours a week on the project. Each of the 218 breweries listed has a summary of what's offered, and whether it has a taproom, restaurant, neither or both. Photos and videos are included with many of the entries as well. "Everyone I've talked to has been surprised that there are that many breweries in Illinois," Gratcyk said. The site also has a searchable map where visitors can look for breweries in specific Illinois cities or towns. Gratcyk also encourages users to submit information on breweries that might not have been included. For more information on Chicagos.Beer, click here.